When you are invited to a barbecue in Northern Virginia, the hospitality can be quite frankly overwhelming. We went up North to attend a friend’s wedding and were invited to a barbecue put on by her next-door neighbors, Jack and Joanne. About 40 of us trooped into Jack and Joanne’s house cheerfully expecting fried chicken and fixin’s and were greeted by a "barbecue" to end all barbecues. First came the baked brie with a glaze of nuts and sugar in a phyllo crust. Then came the hot spinach Parmesan dip and homemade bruschetta. I almost foundered at this point due to overindulgence, but I determinedly stayed on my feet and wended my way into the dining room where a long table was spread with everything from moussaka, to chicken, to baked ham. 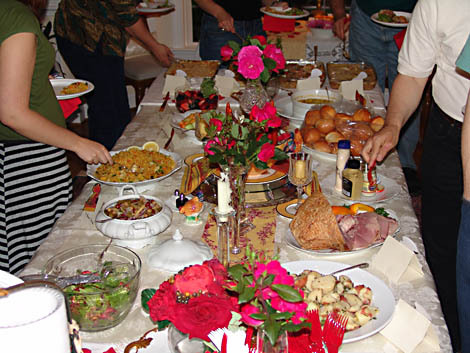 I cautioned myself, "Take a little bit of everything" and steadied myself for a cruise around the table. The food was amazing, but I was strong and was able to restrain myself to only two helpings. I watched with admiration as Joanne continued to pull food out of the ovens as her guests swirled around her and her husband Jack entertained this vast crowd of strangers as though we had all been friends for years. And so it was, because these wonderful people became our friends and will occupy a special place in our hearts for years to come because of their generosity and gracious welcome. I was so taken with the ease with which they took us in and made us feel welcome that I almost overlooked the dessert room. Several fruit cobblers, an ice cream cake, and slow-cranked ice cream awaited us in a glass-walled breakfast room off the kitchen. Jack and Joanne made this wedding rehearsal night even more of a special occasion. Oh, that milking machine photo at the top? That stood in the corner of their living room. Joanne put it there to remind her of her early life on a farm. Okay….I admit it, I’m originally a “City Girl” till I moved to the island. I had NO clue what that contraption was…so thanks for tellin’. What a feast they put out. Guess there’s lots to be said for Virginia hospitality. Sounds like you had a great time and because it also sounds like you were moderate, no need for Mylanta. You’ve made me hungry! I enjoyed cruising your blog! I will be back for more. Love the milking machine! I just finished a huge dinner before reading this post but it still looks incredibly yummy. That’s some mighty fine living. 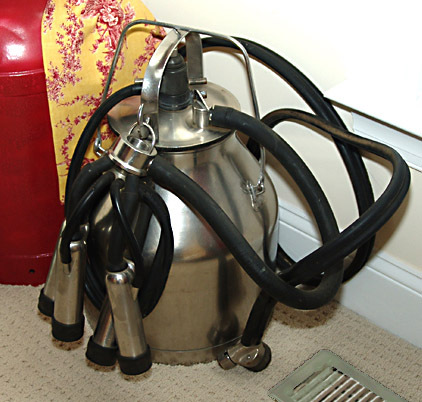 I would have thought the milking machine was some kind of fancy coffee maker. hey, Thanks for the posting, look forward to future ones. You’ve inspired me.